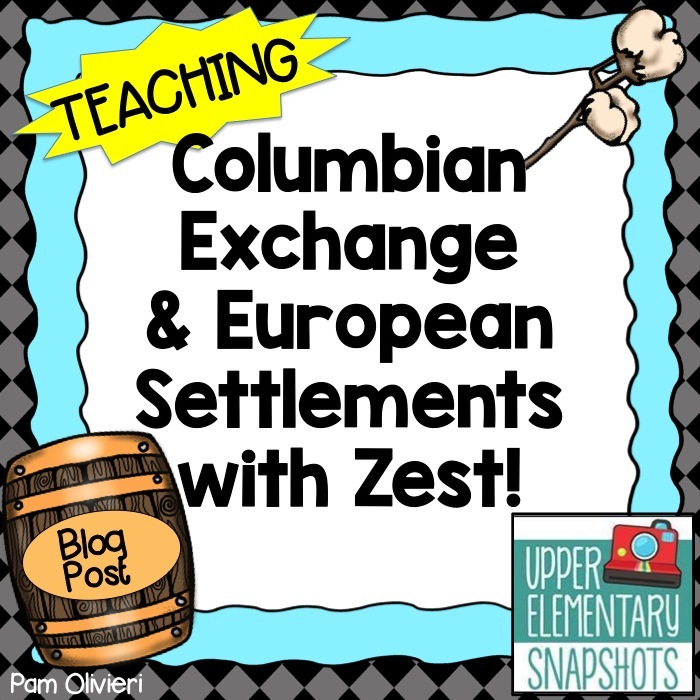 Teaching Columbian Exchange and European Settlements with Zest! Have you ever sat in a boring Social Studies class? Thinking about the monotone voice of one of my Social Studies teachers makes me cringe even to this day! Needless to say, it was not my favorite subject and I never did well. 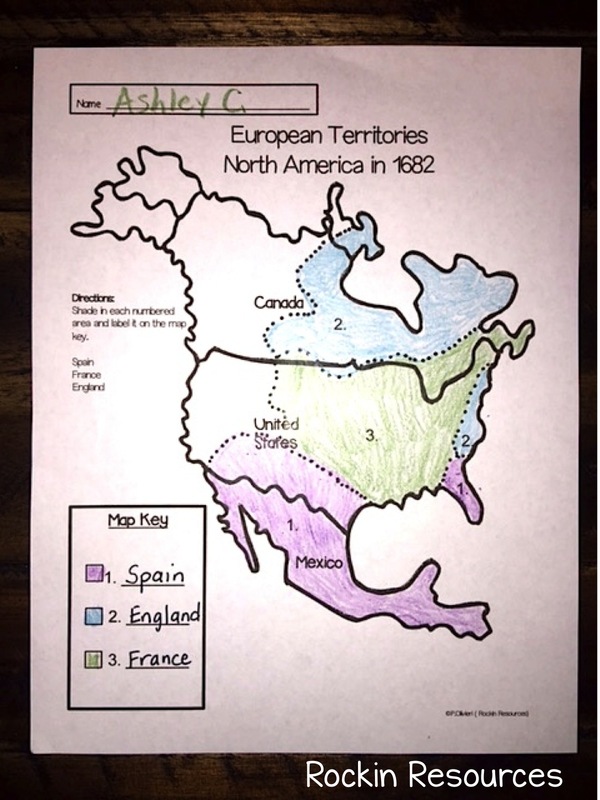 When I became a teacher many moons ago, I was determined to make Social Studies interesting! 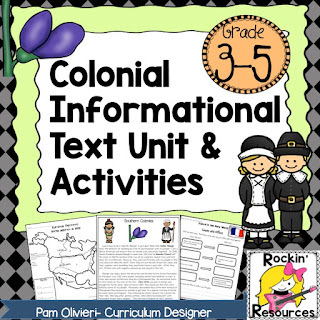 In this post, you will find how I teach the beginning of a Colonial Unit. I like to mix it up with videos, projects, and food! 3. Group Research: Assign each group one of the following: Plants, Animals, Diseases. Have them research where they originated- Old World or New World. They can make a T-chart on with their findings to share with the whole group. Click Here for 3 Free T-Charts. 4. Favorite Food Writing Project: Think about your favorite food. Write down the ingredients of your favorite food and then determine whether or not it originated from the Old World or New World. More than likely some of the ingredients came from the Old World and some from the New World! If you lived in the Old World but one of the ingredients in your favorite food was from the New World, would it taste the same? Choose the Old World or the New World. Write about your findings and tell how it would taste without the ingredients from the other world! 5. 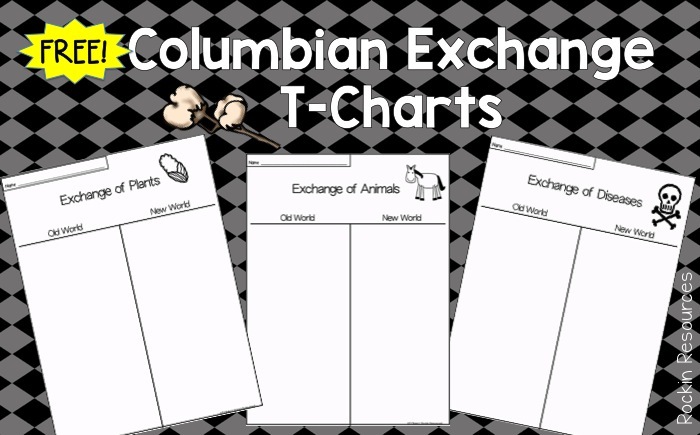 Model the Columbian Exchange: Have each student create a picture of an item from the Columbian Exchange. To make sure they don't draw the same picture, I make a list of items and students pick them out of a cup. Then create spaces in the classroom for The Old World and The New World. Have students take their illustration to the the correct designated area. Then have students move from that area to the other area to model the exchange. Spain was the first European country to use Native Americans as slaves. Some of the slaves were forced to work for long, strenuous days on the plantations where they tended to crops. Spain’s government traded the crops for economic growth. The main cash crops were sugarcane, tobacco, coffee, cocoa, and cotton. Native Americans were also sent to mine for gold where they often encountered harsh working conditions. Many natives died from these poor working conditions as well as hunger. Writing Activity: Pretend you are a Native American. Write a letter to the Spanish viceroy persuading him to free you from the missionary, plantation, or gold mine. 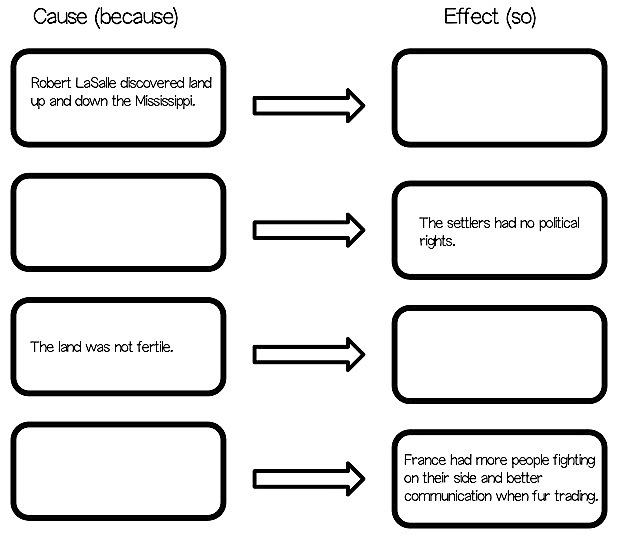 Cause and Effect: Create cause and effect questions to go along with the text. Foldable: Divide paper into 4 sections. 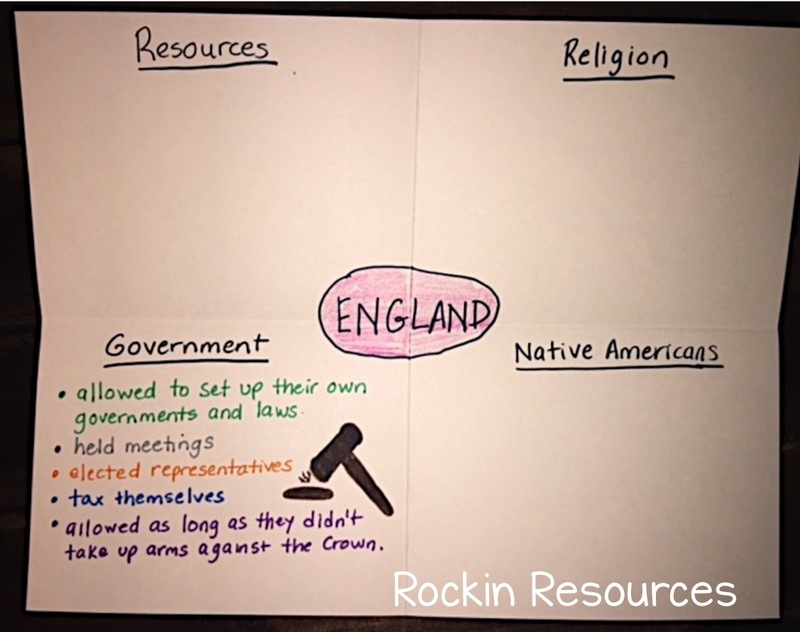 Write the following in each square: Resources, Religion, Government, Native Americans. Have students take notes in each square. Draw an illustration in each. Cookies: Students will never complain having food with their study! 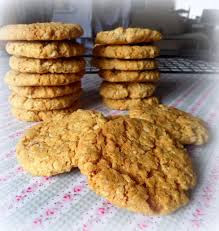 For HOBNOB COOKIES, add 1 tsp. vanilla and 1/2 tsp cup raisins. For APPLEJACKS, add 1 cup chopped unpeeled apples. Add egg (and vanilla if you are making Hobnobs). Beat well. Mix dry ingredients together in another bowl. Add slowly to sugar mixture, beating well after each addition. Stir in raisins or apples. Form into small balls, or drop in the shape of balls on the greased sheet, 3 inches apart. Bake at 375 degrees for 12-15 minutes. 4. Map Activity: Get a map of North America. Have students color in the 3 territories (Spain, France, England) and provide a map key. 5. 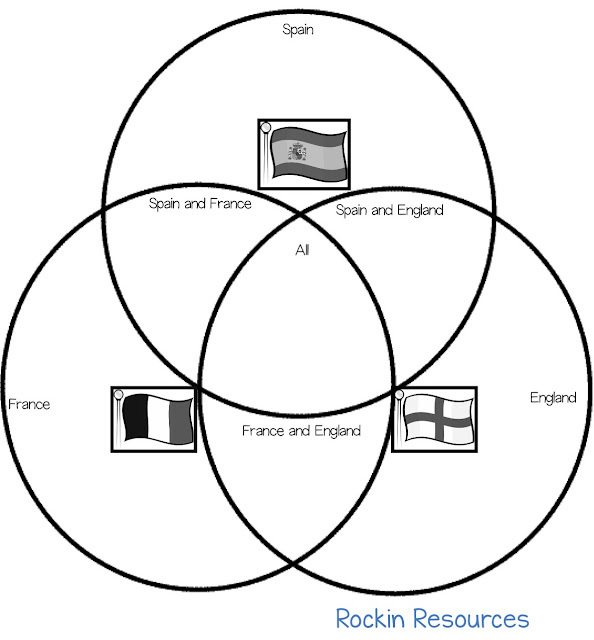 Triple Venn Diagram: Have students create a Venn Diagram like the one below! Then have students answer the following question: If you had a choice, which country's settlement would you prefer to live in? 6. Timeline Project: Choose three dates from each of the European Settlements (9 total) and write a description for each one. I require my students to include a picture for each date. They do this by saving a picture for each date onto their computers. I like them to create a timeline using TIMETOAST. It is an awesome site where they can put their timeline information together! You can find these activities and more in the product below. 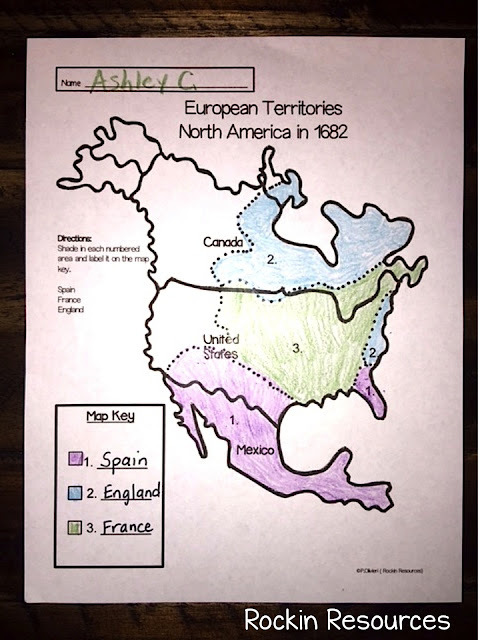 It also includes 13 Colonies and Triangular Trade Routes. Colonial crafts, games and other activities are included. If interested, click here! 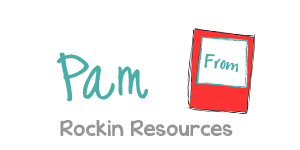 Thank you for visiting our blog!!! 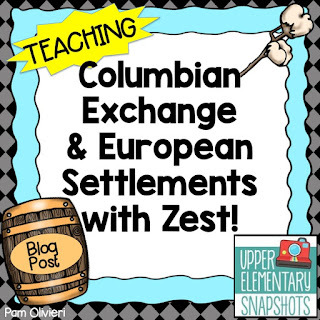 Do you have a favorite activity for Columbian Exchange or European Settlements? I would love for you to share below!